This guide is available to download as a free PDF. Download VLC Player Shortcuts now. Feel free to copy and share this with your friends and family. VLC media player is a free, cross-platform (Windows, mac, Linux) and open source video player written by the VideoLAN project. It supports a huge number of video formats and can play pretty much any video file you throw at it. It’s also listed on MakeUseOf’s Best Windows Software page. With VLC you may also play DVDs, VCDs, and stream various video that are stored online. 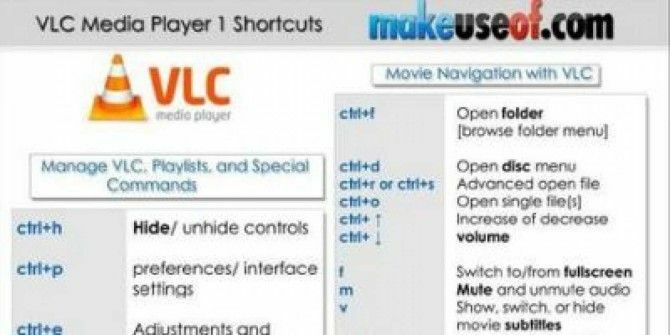 This cheat sheet lists a couple of dozens useful keyboard shortcuts for VLC player. If you’re a VLC fan (just like most of MUO authors) you should definitely get this cheat sheet. Explore more about: Cheat Sheet, Keyboard, VLC Media Player.